Each fall, the Fort Wayne Children’s Choir hosts the Choral Music Educator’s Workshop for teachers from Northeast Indiana and Northwest Ohio. 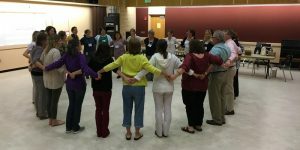 This program brings dozens of educators together to learn a variety of music education methods from well-known clinicians. The workshop is held in the Rhinehart Music Center on the campus of Indiana University-Purdue University Fort Wayne and music students are invited to participate, as well. This year’s guest clinician is Pamela Pierson. Mrs. Pierson is the Associate Artistic Director of the Fort Wayne Children’s Choir. Currently, she serves as a Limited Term Lecturer at IPFW, teaching courses in music education. She previously worked at Lakewood Park Christian School, where she held positions as Elementary Principal and Assistant Superintendent. Prior to her work as a school administrator, she taught elementary music in the Fort Wayne Community School district where she was also appointed to a position as the Elementary Music Liaison. She is a past board member of the Indiana Music Educators Association and Area 2 coordinator for the Circle of the State with Song. She frequently presents at educational conferences and workshops. Mrs. Pierson received her Bachelor’s degree from Taylor University- Fort Wayne and completed both her Master’s degree and the Principal Licensure Program at Indiana Wesleyan University. She is also certified in Levels 1 and 2 of Orff-Schulwerk. Reserve your spot now! Email fwcchoir@fwchhoir.org or call (260) 481-0481 with any questions.